I went to Siesta Key Beach with the intention of relaxing and eating my lunch peacefully. As you can see the beach is spacious and beautiful! 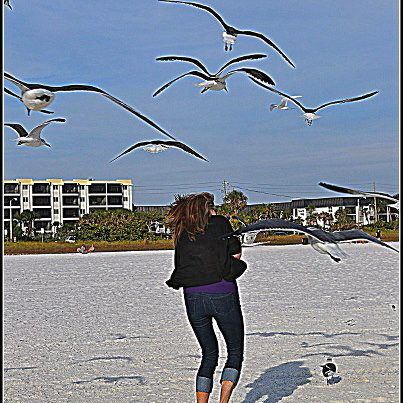 Instead…I’m acting like a lunatic running from masses of seagulls…flapping and flailing my arms…ducking as they dive bomb me…chasing them back…throwing sand at them…trying to protect my food in the aluminum foil! I’ve heard the sand there is white quartz — known for its healing properties! You can read “Your Sarasota” for more information concerning this. Perhaps next time I won’t take food so that I can soak up some of the healing energy! The herring gulls at Joss Bay near Broadstairs in Kent make beach picnics impossible, but just up the road at Kingsgate Bay they leave you alone. I suppose it must be some kind of learned behavior. Mind you when we go to Kingsgate Bay we eat at the Captain Digby pub which is a wonderful little boozer. I love your accent…it comes through in your words! .. that was funny – good thing you survived the attack scathless (and still with your lunch)! Yes…I learned my lesson…no food at the beach! Or bring a weapon! They are so evil at time and they always comes is big groups … great photo, but eating food when there is seagulls around .. isn’t the greatest idea. At least we got a good smile out of it. The spirit of Alfred Hitchcock is alive and well! I also have a ‘visible only to seagull’ sign on my forhead that says “EASY PREY, ATTACK!”. Nothing like a hungry flock of seagulls to ruin a relaxing lunch. I didn’t know it was so common! They’ve adapted very well to all the human activity. Did you managed to eat your lunch? I did finish it! I was determined!! It is a little scary. I actually got more mad than scared and started chasing them! In St. Ives in Cornwall (UK and possibly other places), people have been hospitalised by attacking seagulls. It all starts as people think it’s cute to feed them, then they get confident and expect food and it’s only a matter of time before they help themselves at any cost – remember seagulls are birds of prey. I myself have had an entire Cornish pasty (look it up!) snatched from my hand and gulped down in one fell swoop by a seagull AND it was still in flight when it did it! That’s horrible…I’ll never look at seagulls in quite the same way again! Now did you get to eat your food or did the seagulls get it all.??? Yes…I did. I was bound and determined!